Let’s face it. Having roommates is rarely enjoyable. Of course, it’s more cost-efficient and usually less lonely, however, who wouldn’t want their own place to themselves? That’s usually the dream of people who leave passive aggressive notes to their roommates. Many who fear confrontation resort to these sometimes funny, often cringey, and even poignant notes. These notes have a very clear and concise purpose: the intent to educate and shame all at the same time. Many people obtain roommates in college, but some unfortunate souls, especially those who move into expensive cities for the first time, have to bunk with other people in order to save money on living expenses. This is usually always cause for alarm, as no two people are alike. Hopefully, most people in your house adopt a chores system to keep shared responsibility, however every so often you usually get that one roommate who’s more content with their filth and to put up a fight rather than attempt to be a non-disgusting human. Hopefully, this does not cause a passive-aggressive note war, however, we can’t help but laugh at these 25 hilarious passive aggressive notes left by roommates. 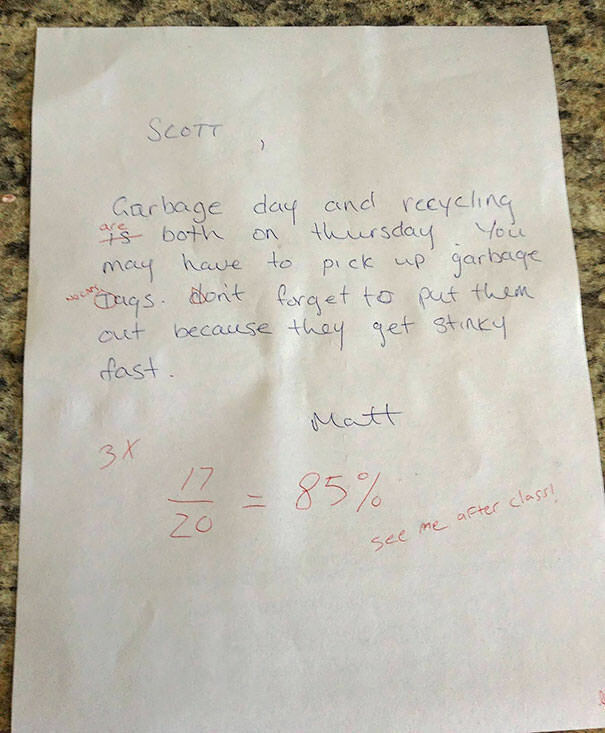 1) Grading The Notes: Scott isn’t dealing with passive aggressive notes without adding a little humor to it. Here, he has taken it upon himself to grade a note left by Matt by editing the spelling, punctuation, and grammar. Clearly, Matt doesn’t know what’s coming to him with this response! Roommate fight! 2) Delightful Note To Gary: Oh, Gary, Gary, Gary. When will you ever get it right? Nobody likes you Gary. Gary never does the dishes because Gary is a ridiculous human being! Here, someone has make it very clear that Gary needs to do what is asked of him by creating a love note between him signed by his friend, Dishes.